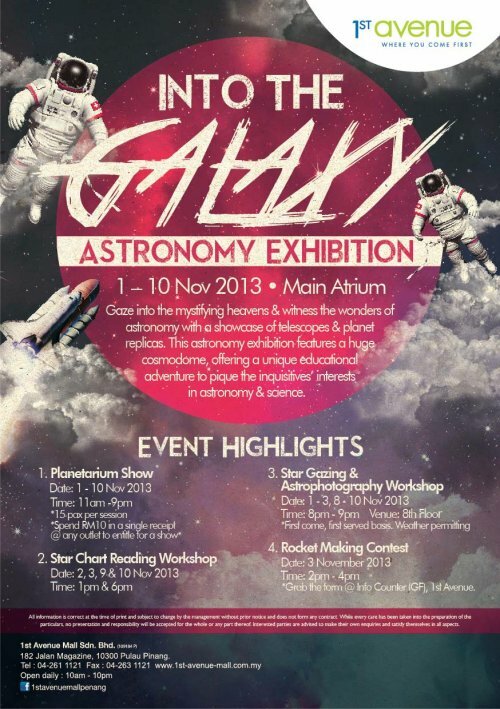 Please come and join us for 10 days of Astronomy Exhibition organized by the management of the 1st Avenue Mall. It is happening on 1st November till 10th November 2013. The exhibition will include section for telescopes, astrophotography, space craft models, planetarium shows and also souvenier corners. Also available on weekends are talk, workshop and night star gazing. All are welcome. Admission is free to the exhibition corners and only minimum purchase may be require to join the planetarium show and workshop.